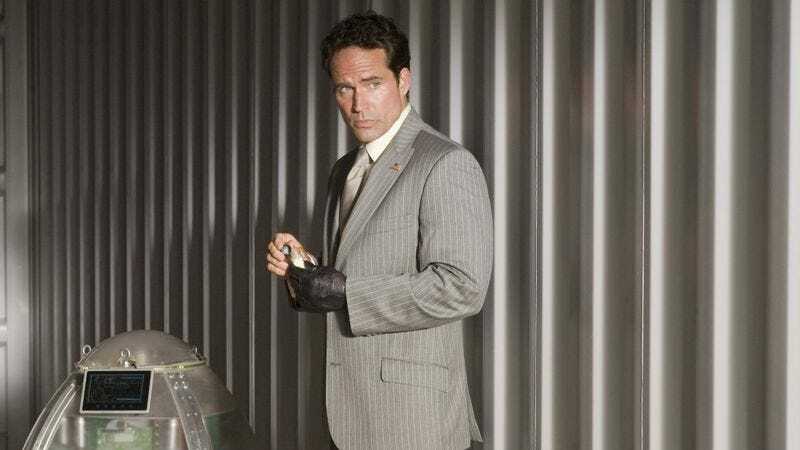 Providing the kind of twist-that’s-not-actually-a-twist we can no doubt look forward to enjoying in the upcoming second season of Wayward Pines, Fox is announcing that Jason Patric has been tapped to take over the lead role in the mystery series. Of course, it was previously called an “event series” until Fox realized there was a more important event happening—namely, making money.And so the previous event is now stretching into the foreseeable future, expanding the meaning of the word “event” in exciting new directions. Patric will be playing Dr. Theo Yedlin, a “confident, driven surgeon whose leadership skills will prove invaluable to the residents of Wayward Pines.” The show will pick up after the time jump that happened in the final minutes of the first-season finale, meaning we’ll be experiencing a Wayward Pines under the control of the First Generation, even as citizens of the town are resisting their creepy rule. The new character of Yedlin “awakens from suspended animation and finds himself in the middle of this rebellion, as he tries to understand what Wayward Pines really is and help preserve the endangered human race.” Also joining this season will be new showrunner Mark Friedman, as original helmer Chad Lodge took off to oversee his new Michelle Dockery-starring show Good Behavior. Or so we’ve been told by a random note on the back of this napkin—apparently, there are no crickets in Good Behavior. Honestly, we’d normally be making a lot more jokes about trying to extend this show beyond the source material, all three books of which were used up in the first season. But then season two of The Leftovers had to come along and show us all how much better a show can be when it leaves the novel it was based on behind, so it’s possible this will be even better than the superb first installment. But probably not. As long as we still get Melissa Leo acting all bananas, though, we’ll call it even.